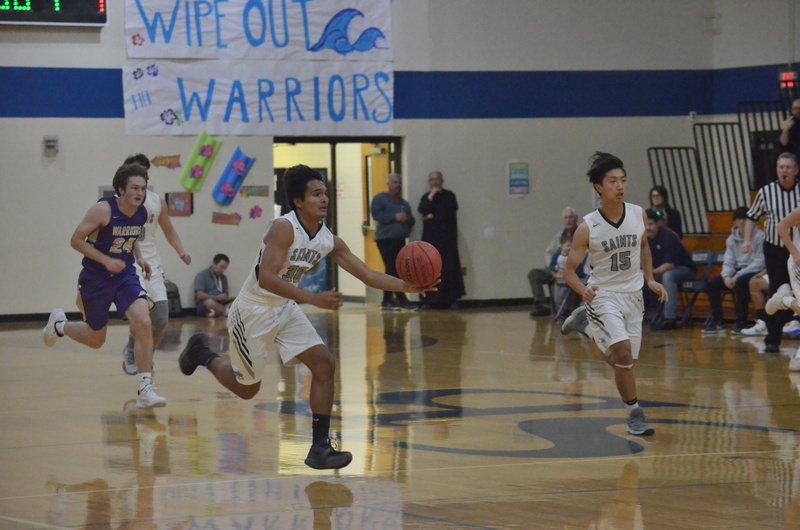 CULLMAN – The Saints got the 2018 basketball season started at home Tuesday night by taking on the Whitesburg Christian Academy Warriors, starting with the junior varsity boys' matchup. It was a battle of the defenses in the JV boys’ game. The first points of the game came with 20 seconds left in the opening quarter on a layup by Connor Berry. After the Warriors tied it up at two apiece in the second quarter, the Saints reeled off seven straight points and went into the locker room up, 9-4. A combined seven points were scored in the third period as St. Bernard went into the final period leading 13-7. The Warriors cut it to 18-13 after a Grayson Pilman trey, but the Saints sealed the win with layups by Druss Hays and Ethan Powell. Berry led the way for the Saints with 11 points and two steals. Hays finished with four points and nine rebounds. Jongha Park ended up with three points, four rebounds and a pair of steals. Caleb Norman finished with two points, four rebounds and two steals while Powell added two points himself. The first quarter saw a combined eight points scored between the Lady Warriors and the Lady Saints and the quarter ended with the score tied at four. The second quarter belonged Whitesburg Christian Academy. The Lady Warriors shut out St. Bernard’s offense and the Lady Saints went into the locker room trailing, 13-4. St. Bernard looked to get something going offensively in the third quarter and Bridget Gallegos helped get it started by drilling a three from the right wing. Emma Tafazoli added a layup later on to make it a 14-9 game, but the Lady Saints couldn’t get any closer than that as the Lady Warriors stretched their lead to 19-11 after three. The Lady Saints cut it to five multiple times on a pair of Gallegos treys, but turnovers plagued them and they fell just short, 30-23. Gallegos led the way for St. Bernard with nine points and a steal. Tafazoli finished with five points, 14 rebounds and a steal. Macy Whaley ended up with four points and six rebounds. Claudia Fallin finished with three points, five rebounds and a steal and Jackelyn Arteaga added two points and five rebounds. The Warriors took an early 5-4 lead on a pair of free throws by Ben Cox in the final game of the evening, but the Saints took over after that as six different players ended up finding the scoring column in the quarter and the Saints took an 18-11 lead after one. They carried that momentum into the second period as they outscored the Warriors, 16-2, to take a 34-13 lead into the half. They quickly stretched their lead to 38-13 on a pair of John Rose baskets to start out the second half, but things quickly went the Warriors' way as they launched a serious rally to get back in the game. A three from Christian Clark cut the Saints' lead to 43-31 after three quarters. St. Bernard looked to get back on track to start out the final period and pushed its lead to 49-33 after a David Kim layup. The Warriors launched one more rally to get back in the game and a trey by Eli Bishop cut the lead to 51-45, but the Saints quickly settled down and sealed the win with a pair of free throws by Rose and four points by Kim. Kim finished the game with 21 points, seven rebounds and a pair of steals for the Saints. Rose ended up with 16 points, eight rebounds and a steal. Gavin Whaley added eight points, five rebounds and a pair of steals. Carson Holmes finished with eight points himself, along with five rebounds, and a steal. Alex Shoaff added two points and a rebound, and Jose Zatarain finished with two points and a steal. St. Bernard will hit the court again on Thursday when they host Athens Bible, starting with the JV boys.